Akira Kurosawa’s Seven Samurai is an action packed epic spooling in at three hours and twenty-seven minutes and remarkably every black and white scene has something to keep the viewer hooked, be it the intense, often noble acting, the fabulous costumes or the brilliant battle sequences. Kurosawa was a huge fan of Hollywood westerns and he transposed a similar, if somewhat extended framework to this film set in 16th Century Japan. The goodies are humble farmers whose remote village is being besieged by a marauding pack of badass bandits. Hearing of another imminent attack the villagers consult the wise old Gisaku who advises them to hire Samurai, hungry ones, who will defend them in return for three meals a day. So a delegation goes to town to sniff out their saviours and one by one the seven are enlisted. 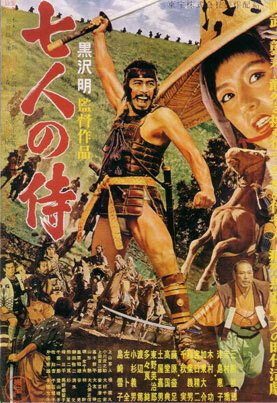 First to be convinced is the cunning strategist Kambei (Takeshi Shimra) whose impeccable and intriguing character soon lures the other six onboard, starting with the impressionable Katsushiro (Ko Kimura) and quickly followed by the impish Kikuchiyo played by Kurosawa’s favourite actor Toshiro Mifune who also starred in his 1951 Academy Award winning film Rashomon. But pitting Seven Samurai against thirty-five mounted bandits armed with guns and wearing outlandish outfits that at times looks as if it should belong on a Viking, is no stroll in the flower filled meadow and every villager must rise to the challenge with anything they can get their hands on including sharpened bamboo poles. Seven Samurai inspired the American remake The Magnificent Seven and it celebrates its 50th anniversary this year with a newly restored and remastered DVD transfer. It looks a treat with the dramatic lighting and camera work by Asaichi Nakai illuminating every dramatic facial expression and physical gesture. It may be a long haul – reels were often left out for screenings here in Australia – but this ‘far-east Western’ is a rich cinematic spectacle with a touching heart at its core.